Oscar winner in 2006 for documentary short subject, Director/editor Ruby Yang’s feature-length documentary “My Voice, My Life” is an emotionally powerful must-see. 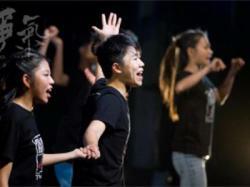 A crowd pleaser on all levels, the film is an moving portrait of a group of underprivileged kids in Hong Kong who join a program to do a One-Night-Only musical. While the students are from all walks of life, many come from schools and districts that are considered poor and under-educated. As a result the students there tend to be marginalized. The documentary highlights the struggles of nine teenagers as they struggle to make it through six months of training while still attending school or dealing with family lives that are less than supportive. In addition, a number of students come from a school for the blind. While about nine students are highlighted, a few stories stand out. Tsz Nok has no confidence in himself, having lost his eyesight a year earlier. While he has adapted to life without sight, his mother struggles with accepting the situation and has chosen to keep his disability a secret, causing him shame. Ah Bok is a handsome, but troubled, student who is always getting into trouble outside of school, and whose antics within school have him continuously being disciplined. Fat Yin is a tough, and cocky kid who reveals he has no relationship with his parents. Both work a lot and don’t pay any attention to him. As a result, he has distanced himself from them and oftentimes treats them just as poorly as they treat him. Sio Fan is an adorable blind girl whose energy and perseverance is inspiring. Coby Wong — who is awarded the female lead in the show — has trouble with her confidence, having felt as though she couldn’t sing, dance, or act. Director Yang does an amazing job of covering each of these stories and making us connect with the kids and want the best for them. When Ah Bok is kicked out of the program, we ache for him to return. When Tsz Nok speaks of wishing his mother would just accept his loss of sight, we wish for it too. Even when the kids are being unruly, we care about them and pray they ultimately succeed. What Yang also does right is allow more of a coalescence of the emotional stories by the time the big show occurs. Yes, it’s lovely to see the kids succeed, but in the end, some of them stand on stage and address people in their lives they want to say something to. These kids who have felt ostracized by society and by their families and in the end find their voice. Their confidence is awe-inspiring, not to mention tear-jerking. This isn’t a heavy-hitting documentary, but it’s a nice group portrait of coming-of-age youths, as well as of school administrators who truly care about their students and want the best for them. This is the feel-good movie of the year so far, even if you find yourself in fits of sobs at the end.